Today we'll talk about how easy it is to integrate SAML authentication with Auth0. So let's start with a hypothetical: you're building a SaaS product, and some of your enterprise customers want their employees to be able to access your product through Single Sign-On (SSO)...and their Identity Provider (IdP) happens to use SAML for authentication. SAML is a complex standard, and so implementing Federation yourself, even with already existing libraries can be quite a nightmare, and require lots of code and maintenance. Luckily, Auth0 supports SAML authentication (you can even use Lock) with just a few lines of code and some configuration. 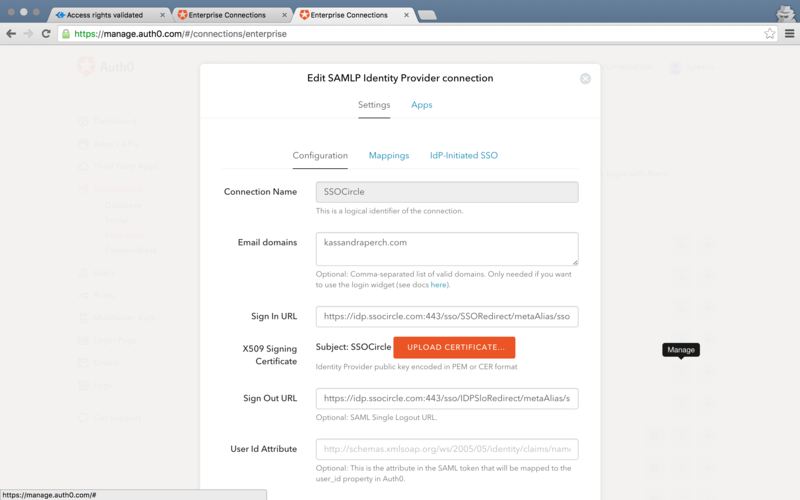 "Auth0 supports SAML authentication with just a few lines of code and some configuration." So what we're going to go over today is how to get that started and how easy it is to switch over to SAML authentication from a social login provider like Google. We're going to leave the 'Client ID' and 'Client Secret' blank in order to test using Auth0's API keys. So, simply hit 'Save' at the bottom of the window. You can now use Google accounts to log in to your app. Next, we'll take a look at how to configure SAML authentication without changing any of the code we've already written. First, I turn off my Google provider. Then, click 'Enterprise' under 'Connections' in the left menu. Click 'SAMLP Identity Provider' to enter the connection management menu. Click 'Create new Connection'. Enter a name in 'Connection Name'. Then, place your SSO Sign In and Sign Out URLs in the fields labeled 'Sign In URL' and 'Sign Out URL', respectively. Finally, upload the X509 Signing Certificate by clicking the orange 'Upload Certificate' button. You can enter domains under 'Email Domains' in order to tell Lock which user emails should be filtered through to this SSO connection. That's it for SAML authentication configuration! Click 'Save' and 'Continue'. You will see a list of instructions-- you will need to provide these instructions to your IdP in order to complete the process (if you are using a third-party, like we do in this tutorial with SSOCircle, check our docs to see if your next steps are up to you). Once you have done this, you can test your new SAML connection in the Dashboard. Go to 'Connections' > 'Enterprise', then select 'SAMLP Identity Provider'. Next to your connection name, you should see a play icon. Click it to try your SAML login from the dashboard. If this works, you are ready to log in using SAML authentication in your Auth0 app! With just a few minutes and no code changes, we have incorporated a SAML SSO into our Auth0 app! Want to learn more? try our free plan, and you can checkout the 30+ social IdPs and the enterprise IdPs that we support. I'm Kassandra from Auth0, and thanks for reading! Want to learn more about Single Sign-On? Get The Definitive Guide on SSO (74-page free eBook) here.